Dyslexia Scotland supports a huge range of people affected by dyslexia, from those with the condition to parents, employers and teachers. 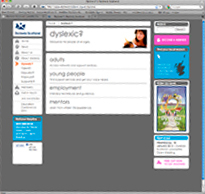 So their website must appeal to all these audiences, and encourage them to come to Dyslexia Scotland for help. In 2009, I wrote the copy for the organisation’s redeveloped site. The website needed to present Dyslexia Scotland as friendly and approachable so those affected by the condition feel comfortable approaching the organisation for support. At the same time, it had to present Dyslexia Scotland as an expert in the field. I wrote compelling copy and case studies to convey these key messages, and promote Dyslexia Scotland as the number one organisation for supporting people affected by dyslexia. A clear, dynamic website where those affected by dyslexia can go for help.